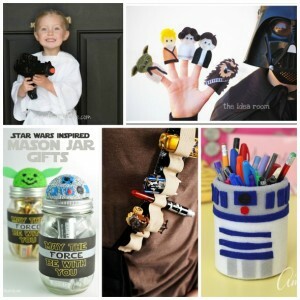 You know that we love a good craft project around here – and that starts with me ( that’s who Black Widow gets her love of crafting from, honestly) I absolutely love most crafting, including making fun clothing items and accessories. 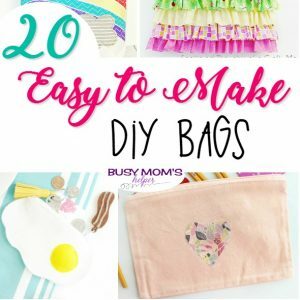 Recently, I had an itch to put together a fun bag for Spring/Summer, which I have yet to finish, but in the meantime am sharing this round up of 20 Easy to Make DIY Bags! 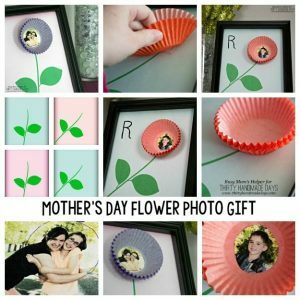 I gotta tell ya, my blogging friends are crazy talented and it was really hard to narrow it down to twenty favorites, but I think you’ll agree that these are so fun and creative. Some of my favorites? The budget friendly cross-body bag (hands free shopping anyone? ), the skeleton flamingo tote and the fried egg zipper pouch- I mean, how super fun are they?! Have you ever made your own purse or tote? Remember those little candy hearts with the words on them we got while we were growing up? Turns out they’re called conversation hearts – I guess because they say something to you? I remember getting them in my little Valentine mail box at school, usually with a store bought Valentine’s Day card attached. You know the ones. 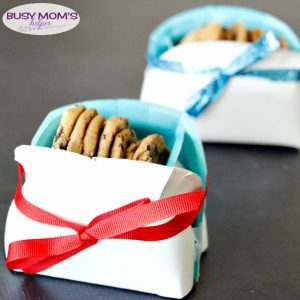 This Valentine’s Day, I decided to bring back a little of that nostalgia with these fun Printable Conversation Heart Treat Containers. Aren’t these adorable? I pass the real thing every year in the grocery store and honestly, I don’t think my kids know much about them. I guess they aren’t as popular as they once were, but they always put a smile on my face. 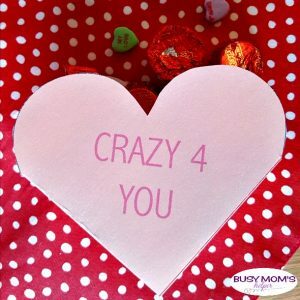 The best part of these conversation heart treat containers is that I’m offering them to you as a free printable. Yep. That’s right, all you have to do is print these off and follow the easy directions on the page and voila! You have a fun, retro treat container for your valentine. One quick tip: When printing, make sure you set it to “Fit to Page” in your print settings. 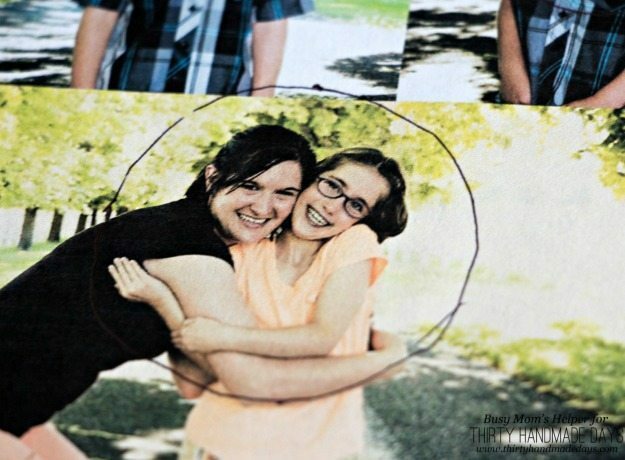 If you don’t the rounded edge of the heart may get cut off depending on your printer. I filled the ones I put together with Reese’s Peanut Butter Cups (a favorite of mine), but you could easily fill these with whatever candy your sweetheart prefers. 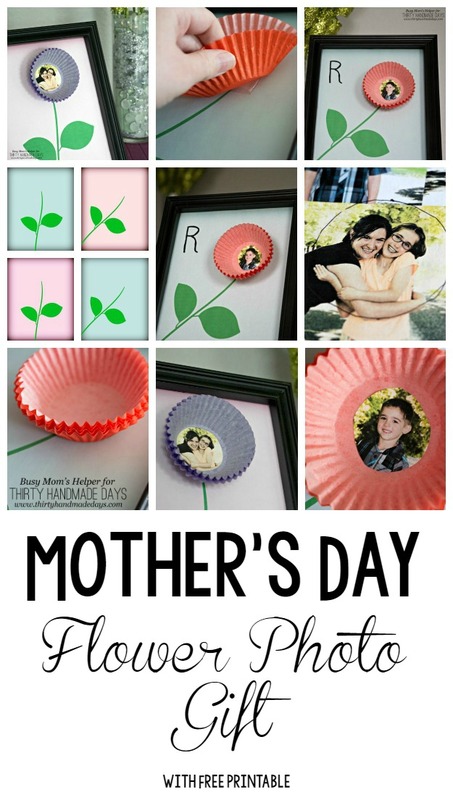 There are four different colors and sayings so there’s a little something for everyone in your family or circle of friends. Do you like conversation hearts? I know they might seem a little old fashioned, but they always put a smile on my face! I’m a big fan of gift baskets, especially for the holidays. For Valentine’s this year, I wanted to take it up a notch and make a game of it, so hubby doesn’t just get awesome gifts, but a fun activity together. 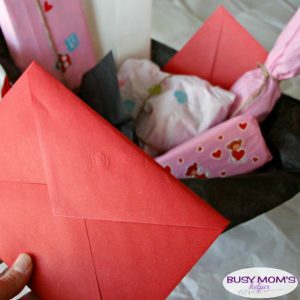 Here’s how you can make your own Valentine’s Day Gift Basket: Guess the Gift game, then enjoy gifting it to a special someone! Hubby’s really use to getting gift baskets – like the Superhero one we did for Father’s Day one year. This year, he’s got a whole different type of surprise – I’m making him guess what each gift in the basket is before opening them! And here’s the fun – things aren’t quite as they appear 😉 To start off, make sure you have all your gifts and wrapping/basket supplies together. I always grab some American Greetings tissue paper, gift wrap and stickers to make the gift look festive. And call me crazy, but I usually grab a couple of American Greetings cards to give hubby – there’s so many that are just perfect, in different ways, that I can’t choose! 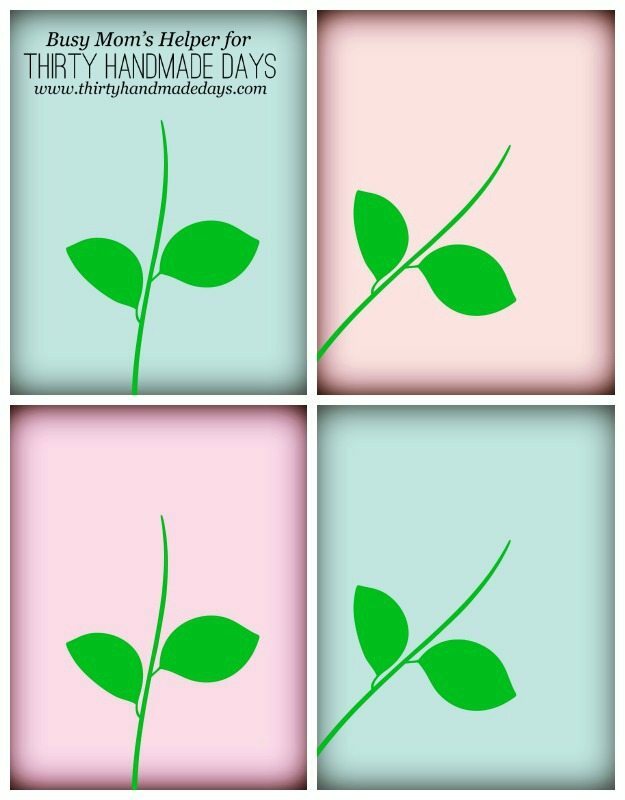 This Valentine’s Day, I selected THREE cards to give him – a romantic, sweet one, a more playful one, and then a pop-up one because, guys, it’s a POP-UP! This year is extra special, as our 10 YEAR ANNIVERSARY is right before Valentine’s Day. Yup, I’ve been married to this amazing man for 10 years, and he’s still my best friend & fellow partner in crime. After all he does for me, I want to show him how much I love him, and that he means more to me every year we spend together! …..or empty chocolate box. Put things inside that wouldn’t normally be in that shape or size of package, making it more challenging for the recipient to guess what their gift is. Since I love giving ‘date night’, I stuck money in a bunch of these packages – but I doubt he’ll ever guess this ‘boxed chocolates’ shaped box is a $5 bill! For larger or awkward items, use your imagination. To give him this fun mug, I tied a bunch of socks around it first. It looks and feels JUST like a package of socks! …it may LOOK like a bottle of sparkling cider, but it’s really a new t-shirt! Here’s how to wrap it up…. The trick is just making sure the top is thinner than the long bottom – just like a bottle. After all this creative wrapping, you’ve got everything you need for a Valentine’s Day Gift Basket that will leave them guessing! If you want, you can download and print off some fabulously festive printables from American Greetings, like this cute mobile/desktop wallpaper calendar that I printed off for my daughter’s locker, or the shopping list complete with tear-off ‘love notes’, or even the 8×10 Valentine’s Day frame-worthy quote to add a little decor to your home. And don’t forget the February calendar! Since my folks will be visiting soon, I found an American Greetings card for my kiddos’ to give them – it’s the perfect combo of sweet, thoughtful and fun. It even comes with a magnet they can stick on their fridge to think of their grandkids! 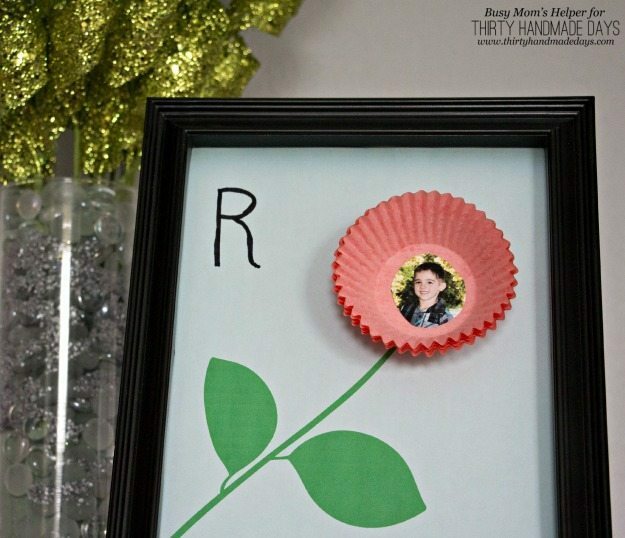 And if you need some ideas for what to write in a Valentine’s Day Card, American Greetings has a great post here, so check it out. Be sure to check them out on Facebook, Twitter, Instagram, and Pinterest – as well as their own blog! Maybe I’m behind the times, but I just learned THIS YEAR about a fun way to surprise people for the holidays – you can ELF them! Whether it’s your neighbor, co-worker or friends, these You’ve Been ELFED Printables can help you put together the perfect gift this Christmas. The first step is to choose who you’re going to ELF – we decided that one of our neighbors, who’s so kindly helped us with our yard this crazy year, was just the right target for our family to gift it to. Next, you need your supplies! 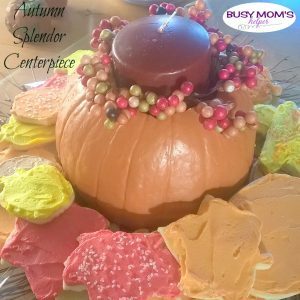 Luckily, you can grab everything at Walmart, from tasty M&Ms Fun Size treats – peanut or milk chocolate – to all the packaging and decorating items you could want from American Greetings. The best part? 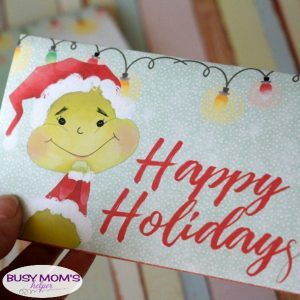 With Walmart’s everyday low prices, mixed with American Greetings’ festive bags, tissue, stickers and fun greetings cards, you can quickly nab everything you need to create merry and bright connections. Since we’re all about making gift-giving EASIER, American Greetings even has a free ELFING printable you can include with your gift that has instructions, a poem and a small sign the recipients can hang on their door after they’ve been ‘ELFED’. I loved the sparkly gift bag I got, but decided the wrapping paper was more what we wanted to use (so I’m saving the bag for later!) and took a plain ol’ box – I’m sure you have plenty of those lying around, too, right? Then we wrapped it up on the outside and stuck the curly bow on the side. 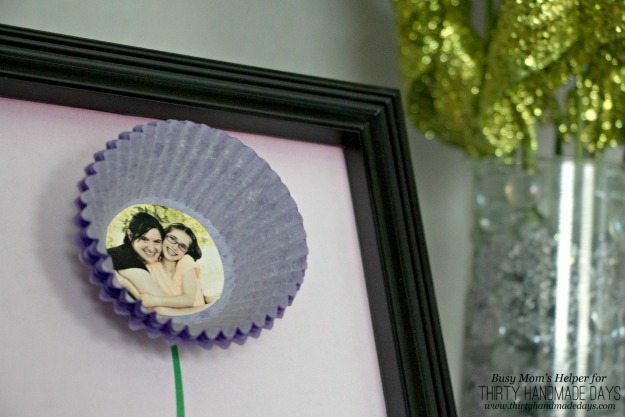 The tissue paper popped up the top making it eye-catching and fun! Okay, my kids convinced me to part with the bear – so sad! But I’m sure the family we’re giving it to will love the fluffy, soft fur, and they sure deserve it for all the kindness they’ve shown us this year. Also to include in your gifts, we made these festive gift box printables – one with Elves, the other with ornaments and snowy background. 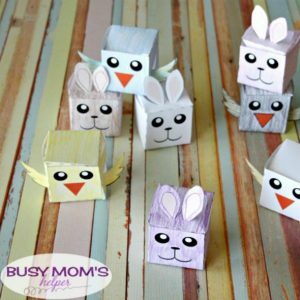 All you have to do is DOWNLOAD AND PRINT: Elves or Ornaments, then cut it out, fold on the creases, and tape it into a box. They’re sized for an 8.5×11 sheet, and do best on cardstock. These printable gift boxes would be just the right size to put in your M&M Fun Sized treats, or small toys if you’re gifting it to a family with kids! Add it to your gift bag (or box), and you’re set to go! We plan to leave it on our neighbors porch after school, since they usually arrive home not long after that. They’ll have no clue who it is, I hope! I love that ELFING is an activity the whole family can join in on, and it teaches the kids the joy of giving to others – something we try to let them experience year-round, but especially during the holidays. AND you can teach them about saving money, earning $2 cash back with this Ibotta offer! For even more fun, check out 12 Days of Christmas Inspiration HERE! 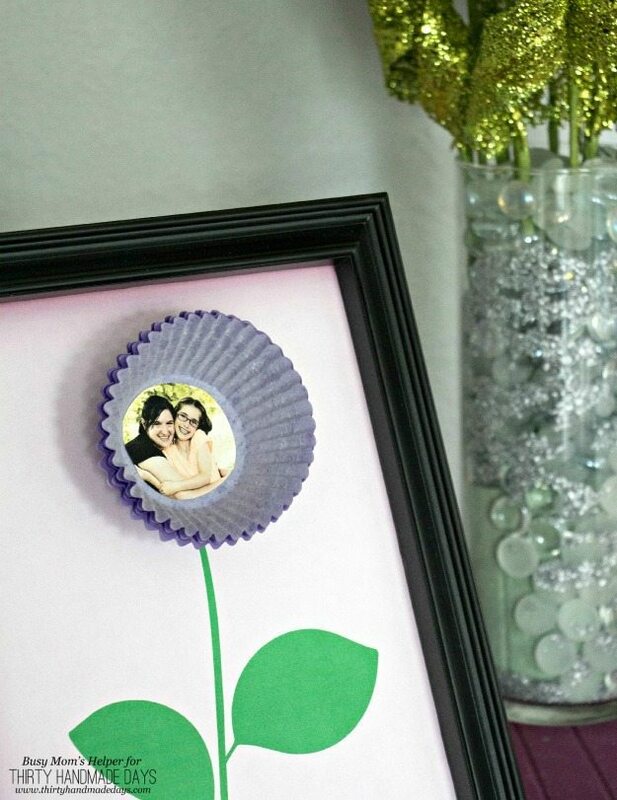 I know it can be super frustrating finding easy-yet-thoughtful friend and neighbor gifts. The Christmas season is busy enough without spending a lot of time, plus you don’t want to break the bank either. 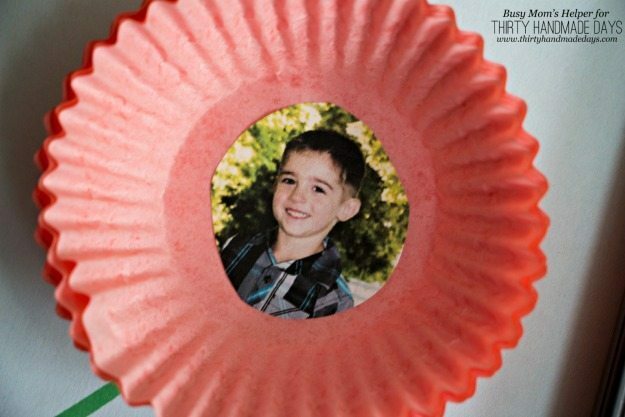 This DIY Holiday Cookie Basket is just perfect – and it’s a gift box made from paper plates! 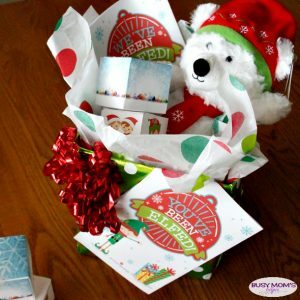 The best part of this gift basket idea, other than how simple to make, is that it’s totally customizable! You can pick the size, colors, even adjust the shape if you want. Get as creative as you’d like with the ribbon, bow or draw a design on the outside. Have fun with it! Cut 4 Slits, 2 on each side and just a little bit inside. The deeper, the taller the walls but less room inside. 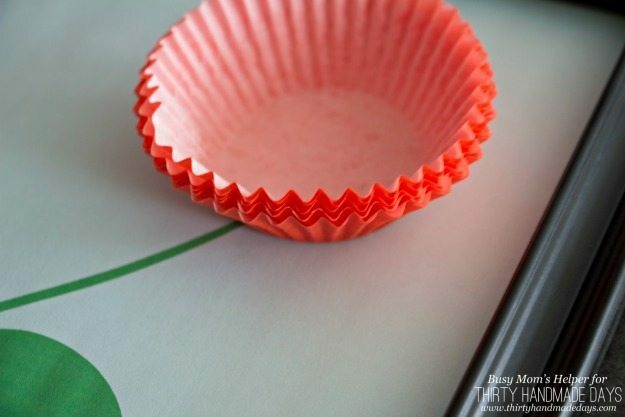 Fold the end flaps inside and the longer side flaps over to create a nice crease. 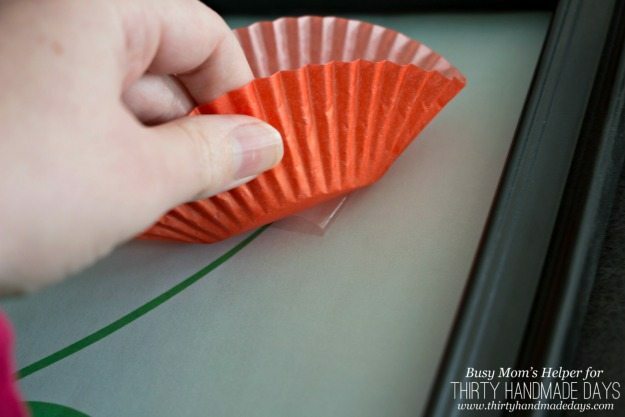 Fold over the ends and tape it securely closed. Now just add your decorations – like a simple ribbon and bow tied around, and your cookies or other gift! If you’d like, you can also put parchment paper inside for extra protection for the goodies, but that’s your choice. I also made these baskets back at Easter – you can see them HERE. They’re just as fun and simple now as they were then. Fill them with a favorite cookie, like my Dad’s Healthier Chocolate Chip Cookies – still one of my favorite recipes! You can whip up a bunch of these in no time – I think it took 5 minutes to do these 3. You can cover the whole neighborhood in no time! The part I CAN’T really help with is the passing out – good luck with that 🙂 At least you can enjoy the holiday lights and maybe turn up some music on your phone while you go around! 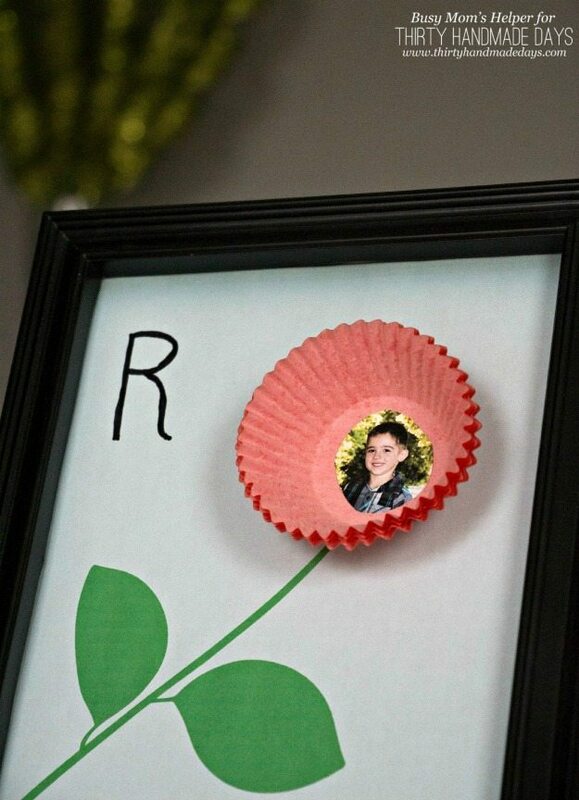 I love crafts and diy projects year-round, but the holidays tend to bring out my creative side even more so. This awesome list of 20 DIY Stocking Tutorials is perfect for anyone wanting make your own stocking this Christmas! Imagine your kids choosing their own styles and actually HELPING to make it – what a special time together, and a lasting keepsake. What would YOUR favorite stocking design be?